I discovered yesterday, Monday, that I will not be moving to my site on Monday as planned, but will be moving there Thursday, which is not a problem. So, I will update you all on what my placement is like next week. On Sunday, we went to St. Andrew’s Presbyterian Church and then to one of the greatest meat places to which I have ever been thus far in my life journey. It is called Pampa Churrascaria and is in Nairobi. It was our last meal together as a group before we split up to our different sites. It is the nicest restaurant I will encounter while in Africa, I presume because I’ll be paying for the rest of my meals. They brought out 16 different kinds of meat to us, which took a while, but I decided to wait until they were all upon my plate before I started eating. Therefore, the 7 women had finished eating and the 2 other males were slowing down when I began, but it was marvelous once all 16 had arrived on my plate. 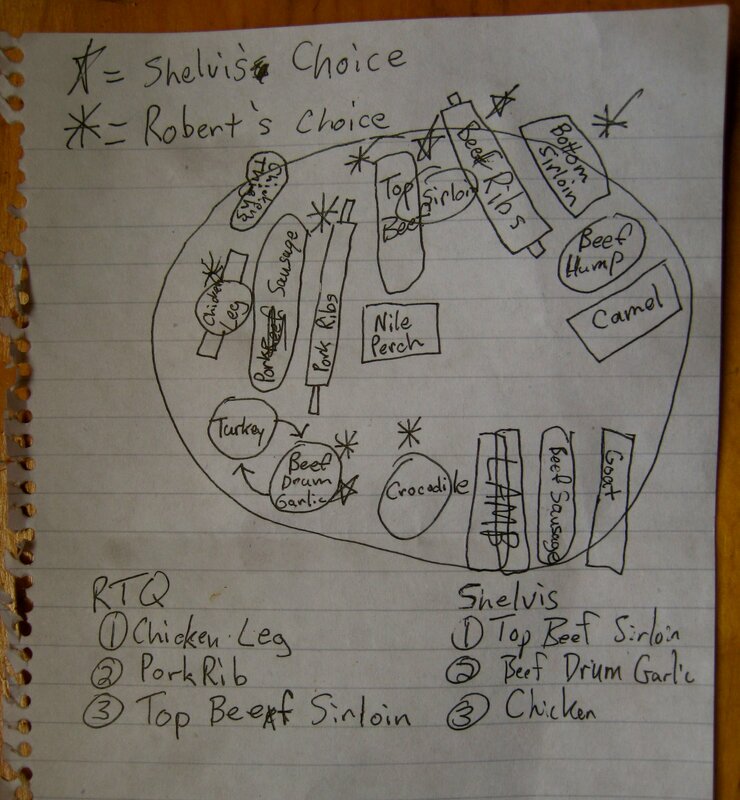 To know which meat was which I decided to make a chart. In order to share my experience with you all I decided to take a picture of all the meat, label each meat with a number, and write down what they all are below. I hope all is well with everyone! Have a great week! Today is our 3 week point in Kenya. This coming Monday is when we all go off to our sites for the rest of the year. 2 go to a small town outside Nairobi to teach at a high school, 1 is going to the coast of Kenya on the Indian ocean to be a Biologist, and I am moving to Karen which is northwest of Nairobi. The remaining 4 are staying in Westlands very close to the Supervisor’s house. Orientation has been a great bonding experience for the 8 of us and a great introduction to Kenya. We are all excited about going to our placements, but I think once we are there we will miss each other quite a bit, especially me and the coastal person because we will have to travel to see anybody else from our group, but it will provide a good opportunity to practice Swahili! I have been asked about Barack Obama in the past 3 weeks frequently. Barack Obama is like a hometown star because Obama’s father, Barack Obama Sr., was a Kenyan who lived in Kenya all of his life except for college and graduate school in the States. However, Obama only met his father for 10 days when he was 10 years old in Hawaii and didn’t visit Kenya until his late 20s. So, Obama is a hometown star who didn’t grow up in his hometown/country at all which makes an interesting situation and Q&A sessions. I’m sure that I will have many many more conversations about Obama in the next 11 months. I did all of my laundry by hand for the first time this week. Apparently, in terms of clothing, I only brought 10 tops (T-shirts, long sleeve), 7 bottoms (Jeans, Khakis), a suit (2 ties), some socks and boxers, dress shoes, trail shoes, and chacos. I washed all the tops, socks, and boxers and it was an experience. I soaked, wrung everything out, and attempted to find places to hang everything to dry. My forearm muscles burned like crazy because of (attempting to) wrung everything out (reminding me of trying to beat a cake in Zambia and getting very tired before the job was done). However, I actually enjoyed washing everything by hand. The first time you do something it is usually more enjoyable than every time after that. 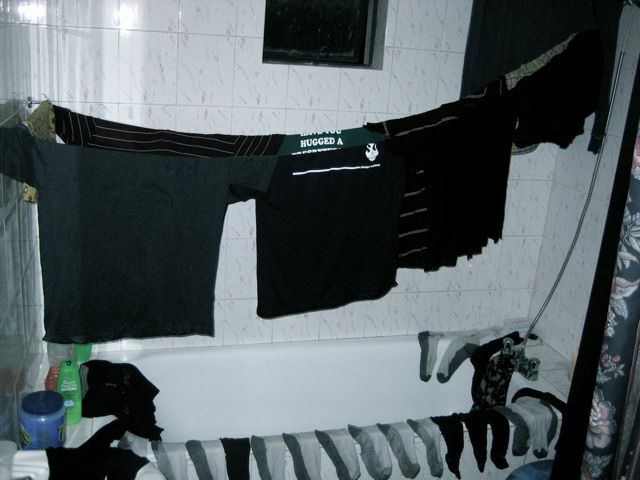 However, I know that I will respect clean clothes more now and be proud of how clean/dirty my clothes are. Sunday we went to church and then to the New Life Home. The New Life Home takes in orphans, especially those who are HIV positive, and gives them a place to be taken care of until they are adopted or find a foster home. There are currently 52 children there. There are babies (new-6 months), the “crawlers” (6-12 months), and the toddlers (1-3 years). We arrived right at the end of naptime and so all 8 of us grabbed a “crawler” and carried her/him downstairs and outside to go play. I spent an hour hanging out with 2 “crawlers” mainly. One would cry until I hugged him and the other would attempt to find anything to put in his mouth. It was good times. Then I went to hang out with the babies and ended up bottle feeding 2 and helping transport the rest to diaper change time and pajama application. It was a wonderful afternoon and we were all very happy afterwards. We have been invited to return whenever we would like and so I hope to do so throughout the year. I think it would especially be a helpful break during a stressful week. If you have not already done so please check out the pictures I added this weekend in the next post by clicking the play button in the center. Have a great day and I will write to you from my site placement next week. -If you would like to pause just put your mouse over the middle at the bottom of the picture. -If you would like to see the pictures bigger, then put your mouse over the bottom left corner and click on “Pictures Week Two” when it pops up. You’ll be taken to another page where you can see the pictures bigger. Word. Let me know if you have any questions and please comment. I am quite proud of a few of the pictures. Have a great day! Kwaherini (Swahili for goodbye to a bunch of people). Hello friends! Today (Thursday), our group is going to an archeological site! An Archeologist from the University is taking us about 2 hours outside of Nairobi to a site for the day. We are unrealistically hoping to find some dinosaurs that have never been found before in our 6-hour time slot. Any name ideas? We are learning more about Kenya everyday. Kenya has 42 tribes and each tribe speaks its own language, but the national language is Swahili. People (usually) are very proud of the tribe from which they come. One Kenyan said that violence only last for a maximum of 3 months in Kenya because if 2 tribes are fighting the other 40 tribes want them to stop fighting so they can go on with their business. Of course, some tribes are much much bigger than others, but when you add them all up it creates a big voice. Kenya became independent from Britain in 1963 and is still a young country when compared with the rest of the world, but an average age when compared with all of the African countries getting their independence from colonization. Swahili lessons are still going on formally and informally. It is a nice language because everything is spelt like it sounds. I came to the realization that Swahili is the first language I am learning which I actually get to use conversationally. Latin, Biblical Hebrew, and Biblical Greek are not commonly spoken languages…at least where I hang out. However, I get to practice Swahili everyday. When I return to the states I am not sure how helpful it will be (except for quoting the Lion King), but for now it is incredibly helpful and (intriguing) to know what everyone is saying. I have been very careful to use the word different when describing how certain things are here compared with the States. For instance, they drive on the different side of the road, not wrong. My favorite “difference” currently is their definition of cold. It is what I consider very nice weather here; however, when it drops below 75 the Kenyans bundle up. A few nights ago when I came home, it was around 70 and our gatekeeper was bundled up like an Eskimo (beanie, scarf, and heavy coat). I walked by him in my T-shirt feeling like it was a nice fall day. It would have been a good picture. This was also evident when I was with my host family last week and had sinus problems, every time I would cough they would make me put on a jacket (or another jacket) because I was “cold.” They did this until I started sweating and explained to them that this cold weather for them was actually quite nice for me. Finally, I will end with my funny church story of the week. We went to a Lutheran church Sunday morning which was very structured and only an hour or so long which was nice. However, during communion I got a shock when I unintelligently assumed the liquid in the cup was Welch’s grape juice (like it is usually in the Presbyterian Church in the States) rather than wine. Luckily, I did heed to my body’s impulse to spew, but returned to my seat and coughed for the next several minutes. This could have just as easily occurred in the states at a Lutheran church, but something makes it more special in Africa. Well, I hope all is well back in the States! I miss all of you and really enjoy hearing from you so thank you for your comments and e-mails. Have a great day! I’ll blog you next week sometime. PS I will post pictures when I have a faster connection. Hello friends! Here are the pictures that I could not post earlier. I post my pictures usually in a slideshow. If you are like my beloved mother and slightly technologically troubled here is how it works. The slide show will start automatically when you visit the blog. Once it shows all the photos it freezes on the last picture. Click on the box in the center (with a play button) to start the slide show over from the beginning. If you want to scroll through the pictures use the back and forward arrows at the bottom of the picture in the middle.